These units come with a fan, water to air heat exchanger and louvered grills. Stamped fan blades quietly exhaust high air volumes. All parts used are high quality. Dragon Breath Unit Heaters mount just about anywhere. They are used to heat basements, garages, workshops, greenhouses, warehouses, and anything you can think of due to their small and compact design. These units come with a high-quality “Venturi-designed” fan, water to air exchanger and adjustable louvered grills. The fans are speed controllable (SC36) and are commercial grade units. Stamped fan blades quietly exhaust high air volumes. You can trust that all parts used are of the highest quality. Units come assembled! These unit heaters are 110 volts, sending boiler water in and out of them because they’re water based. 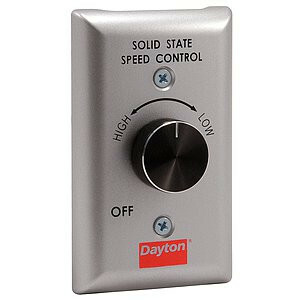 The fan is mounted in the back, which blows heat to the area of your choosing. The motor of the unit heater is a totally enclosed air over motor enclosure, producing 1200 CFM. Also, it has a sleeve bearing system and a 1550 RPM motor. In order to find out which unit heater suits your needs, use the basic formula of 4,000 BTU's per 100 sq. ft. Consider more or less BTUs based on geography and buildings insulation. Unique situations such as a home having "0" insulation, some adjustments may need to be taken. For "0" insulation and greenhouses, use the 6,000 BTU's per 100 sq ft formula. Oversizing usually is not a problem. *Venturi-designed fans are ideal for high pressure or high airflow usage scenarios featuring detailed engineered elements that contribute to a low-noise yet a maximum performing solid fan. You can trust that all parts used are of the highest quality. 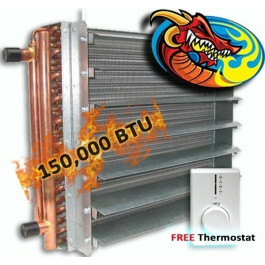 Used to heat large basements, very large garages, workshops, greenhouses, warehouses and more.